SLT PREMIUM PACKAGE includes (PCY) SLT Convenience Package and (NZM) 20 Polished aluminum wheels; Crew Cab models also include (BVT) Chrome assist steps Double Cab models also include (VXH) 6 rectangular chromed tubular assist steps LPO. With Incentives like these-- this one is hard to pass up! 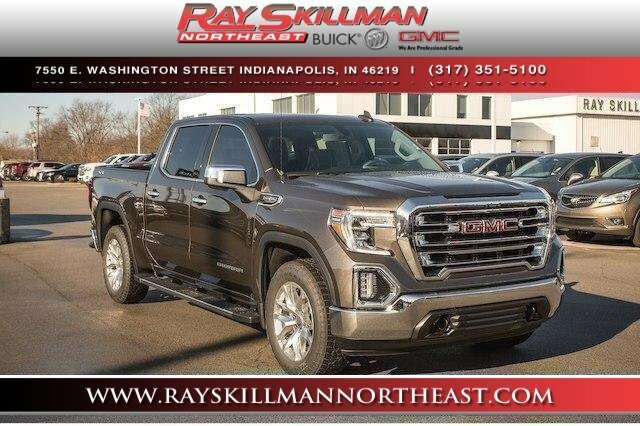 You will love driving this 2019GMCSierra 1500 with Standard features include: Leather seats, Bluetooth, Remote power door locks, Power windows with 4 one-touch, Heated drivers seat, Automatic Transmission, 4-wheel ABS brakes, Air conditioning with dual zone climate control, Cruise control, Audio controls on steering wheel, Traction control - ABS and driveline, Driver memory seats, Memory settings for 2 drivers, 5.3 liter V8 engine, 8-way power adjustable drivers seat, Head airbags - Curtain 1st and 2nd row, Heated passenger seat, Multi-function remote - Trunk/hatch/door/tailgate, remote engine start, Passenger Airbag, Power heated mirrors, Tilt and telescopic steering wheel, 4 Doors, Four-wheel drive, Fuel economy EPA highway (mpg): 21 and EPA city (mpg): 15, Heated steering wheel, Front fog/driving lights, Compass, External temperature display, Tachometer, Bed extender, Clock - In-radio display, Engine hour meter, Pickup Bed Type - Regular, Self-leveling headlights - Self-leveling, Stability control - With Anti-Roll, Trailer hitch, Transmission hill holder, Trip computer.... With our guaranteed approval program, you can drive home today in the style you deserve!